Join the Oak Lawn Park District in cooperation with S.R.A.S.A. in celebrating 39 years of Volleyball For Charity! 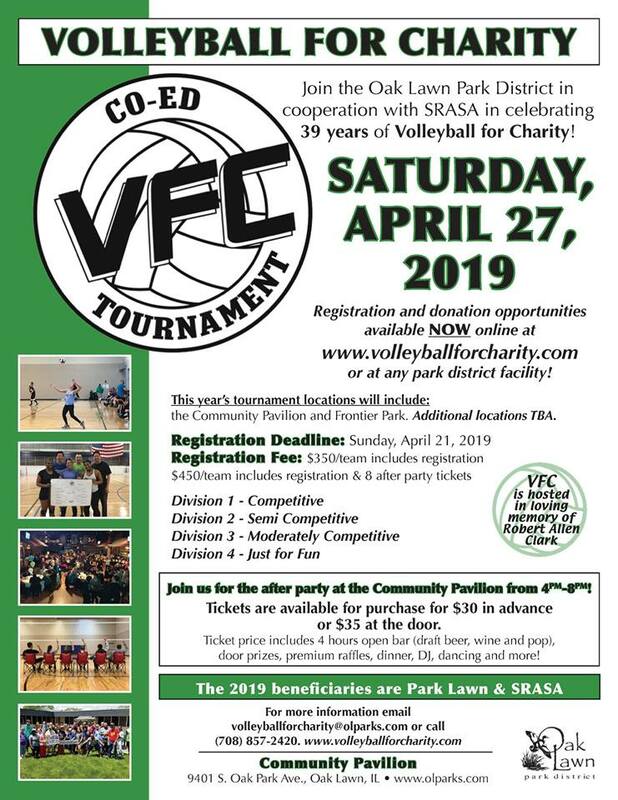 Registration and donation opportunities available NOW online at www.volleyballforcharity.com or at any park district facility! This year's tournament locations will include: the Community Pavilion & Frontier Park Sports Complex. Additional locations TBA. + Division 1-Competitive - For teams with high level caliber players that recently participated competitively or in college. + Division 2-Semi-Competitive - For teams who play in leagues that are competitive, but not at power level. + Division 3-Recreational - For teams who play in leagues which are moderately competitive or 40 years of age and over leagues. + Division 4-Just for Fun - For teams who want to play recreational volleyball, with minimal spiking. JOIN US for the after party at the Community Pavilion from 4PM-8PM! Tickets are available for purchase for $30 in advance or $35 at the door. Ticket price includes 4 hours open bar (draft beer, wine, and pop), door prizes, premium raffles, dinner, DJ, dancing and more! The 2019 beneficiaries are Park Lawn Charity & S.R.A.S.A. !